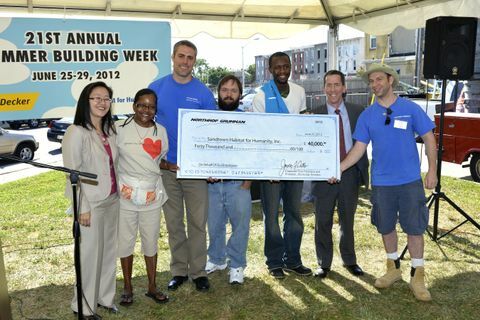 BALTIMORE, July 26, 2012 -- Northrop Grumman Corporation (NYSE:NOC) recently donated $40,000 to Sandtown Habitat for Humanity as part of the company's ongoing partnership with the Sandtown neighborhood restoration project. The Northrop Grumman contribution will be used to help fund the renovation of a house on North Gilmor Street. This will be the fifth house Northrop Grumman has sponsored in the Sandtown project in West Baltimore, bringing the company's total contribution to $190,000 since 2004. "Over the years, our employees have volunteered thousands of hours to benefit the communities where we work and live," said Melissa Sandlin, Northrop Grumman's manager of community outreach, who announced the company's financial contribution as part of Sandtown Habitat for Humanity's 21st annual Summer Building Week June 25-29. "Northrop Grumman is proud to support the Sandtown Habitat for Humanity mission of increasing home ownership and a sense of community in West Baltimore." During Summer Build Week, employees of Northrop Grumman's Electronic Systems sector, led by Andrew Clark, Kurt Van Ryzin and Rob Siegel, donated their time and effort to help with ongoing Northrop Grumman-sponsored home renovation projects in the Sandtown community. Sandtown Habitat for Humanity is a nonprofit housing organization dedicated to rebuilding the vacant housing in the Sandtown neighborhood in West Baltimore. Through the hard work of volunteers and private donations, Sandtown Habitat for Humanity has completed 305 houses in the community over the past 21 years. The completed homes are sold to low-income families, with the payments on the zero interest mortgages put into a fund that helps to finance future projects in the community. "It is nice to build on the momentum of past home sponsorships, and it is a great opportunity to give back to the community," said Siegel, a Northrop Grumman engineer and the Sandtown project lead. Siegel has been volunteering with the Northrop Grumman team since the company began its partnership with Sandtown Habitat for Humanity.